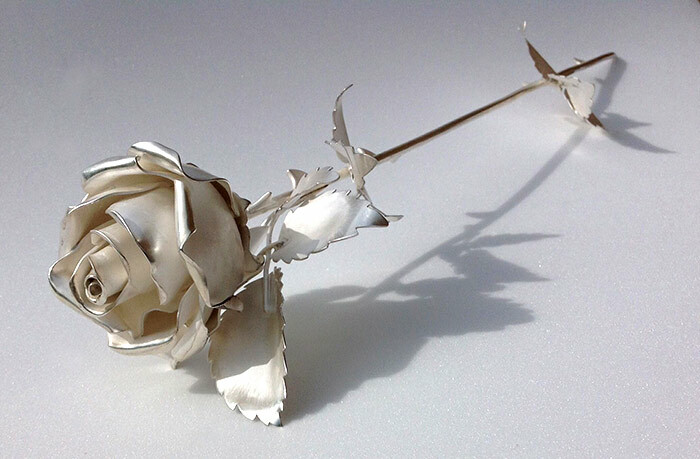 The rose was fabricated using traditional silversmithing techniques. It was made from 925 solid silver and is hallmarked with the makers mark. These exquisite silver roses are made to order for any special occasion. The rose features heavily in the production of Der Rosenkavalier. The funding to buy the silver was provided by a Fellow of Glyndebourne Opera House. Measuring approximately 550mm and weighing near to 700grms the rose is a large scale theatrical hero prop that has been seen in over 80 shows. It can be seen again during this seasons production of Der Rosenkavalier. Since it’s first appearance we have made over 9 smaller replicas that have been purchased, 3 of which have been used in wedding proposals during the Glyndebourne interval picnics.